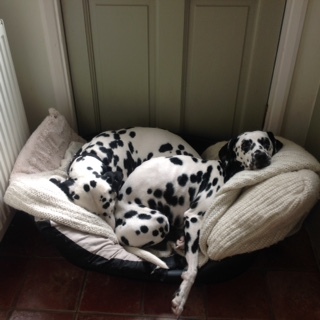 Dalmatians are notoriously bouncy dogs, full of beans, and love nothing more than a good dose of exercise. However, it is important to make sure that you get the balance right, and not impose too heavy an exercise regime. 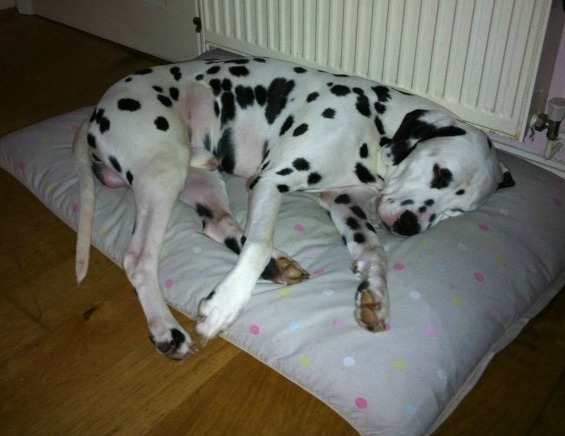 All dogs require a lot more sleep than we do, and Dalmatians are no different. Adult dogs need around sixteen hours of sleep per day, whilst puppies need up to twenty hours. It’s therefore vital that they aren’t disturbed whilst sleeping, and that they feel safe. Dogs are ‘polyphasic’ sleepers – they choose somewhere to sleep for a short period, before moving somewhere else to sleep. A very normal and instinctive behaviour. It’s therefore a good idea to make sure there are plenty of choices of where to sleep, including a variety of bed options (blankets, cushions, sofas, etc). Dogs are social animals, and normally like to sleep with company, day and night. However, if in a multi-dog household, they may need the opportunity to sleep alone, in peace from the others (especially if very young or old). Dogs also like to have some peace and quiet – households can sometimes be too noisy and active for them when they’re trying to sleep. Good quality, comfortable sleep will promote and maintain good health in all dogs. It is also worth pointing out, that dogs who are experiencing high levels of stress, may find it difficult to settle down and sleep. A common mistake for people to make, is to think that their dog must need more exercise in order to promote tiredness. This is very counter productive. Excessive amounts of cortisol (the stress hormone) that a dog produces, are too much for the brain to cope with, and are transferred to the leg muscles, so the dog becomes very restless, and over reactive in their environment. Observation is paramount, your dog will always let you know how he is feeling. Keeping things quiet and low key for the dog, encouraging the use of their nose has a very calming effect, as does chewing. Giving your dog something to chew will be very relaxing for them.